I will, this coming election, vote for a Democrat for President for the first time in my life. The reasons, I must admit, are selfish. It happens I own a business that buys gold, silver, collectibles, coins, paper money, etc. from the public. As the dollar has declined, in some measure to fears that the US is back-pedaling on the War on Terror and other reasons (1), gold has risen dramatically. The high price of gold has brought many people into my place of business (which I won't pimp here) where I am making more money buying gold than selling Jewelry. A casual glance through local newspapers will reveal that most of the other jewelry stores in town are advertising that they, too, are buying gold, although no one buys the breadth of products that I do. If Obama is elected, I honestly believe he will try to put through a number of outright socialist programs (universal health care, for one) that should make the dollar plummet even further. In addition, I hope he is able to somehow withdraw all of our troops from Iraq as quickly and as dangerously to world stability as possible. Negotiating with Iran would be a very good thing as well. These few things alone should drive the price of gold to $2,000 an ounce or more, Allah willing. If things go right and only one or two small cities get nuked (hopefully Baltimore or Detroit, you know, cities that this country would be better off without), then gold will reach a level that I can only dream about. By 2012, things should have gone so badly, with any luck, that after I have made an enormous fortune in gold, the American public will realize what complete schmucks they were for ever voting for an anti-war, leftist President, that Reagan-type conservatives can take over the reigns of power in Washington. Drunks will never admit that they have a problem until things get so bad they can't get worse. We need to elect an imbecile socialist to help this country wake up. I ask everyone reading this post to help make me rich beyond Midas; vote for Barack H. Obama for President. A suggestion to my loyal readers: dump stocks before the public wakes up to the fact that Obama will sink this country. N.B. 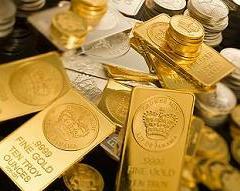 Gold fixed in London today at 883.50 per ounce. Sub-prime loan crisis made possible by Democratic urgings that banks be more sympathetic to credit-unworthy borrowers, you know, the constituency of most Democrats. Energy Policy Failures, especially Democratic opposition to nuclear plants, over-regulation of refineries, etc.